When Champion Gourmet closed last April (at about the same time as Paymon’s folded its tent downtown), there was much gnashing of teeth and rending of garments over the latter, but nary a peep about losing the former. Guess which one represented the loss of a true gem on our gastronomic scene? We’re happy to report that Champion has returned! Open just three days now in a bigger, brighter, nicer space on South Jones just north of Spring Mountain Road, with much of the same menu, the same sinfully cheap prices, and some of the best noodle soups this side of Taipei! The correct name is Yin Mei Champion Taiwan Deli — but it will always be Champion Gourmet to round eyes like ELV, who loves the soups, the dumplings, the stinky (aged) tofu, the hotpots, and just about anything and everything that comes out of this very authentic kitchen. In case you don’t get the hint…this ain’t no place for no kung pao chicken or sweet and sour pork gringos. If you’re a novice (an adventuresome novice), stick with the dry noodle bowls (really noodles smothered in sauce) like spicy peanut wide noodles or minced beef noodles. Or any of the dumplings. Fresh made, steamed and satisfying, they’re a meal unto themselves or a perfect starter for two. If you don’t mind finding edible curiosities in your comestibles, dive into some of the soups, but regardless, be ready for a bill for two that is always well below $30 (including tip), for some of the tastiest Chinese food in town. If you’re curious about the first photo among our tasty snaps, it’s of the only thing we don’t like here — the desserts. Boiled beans and boiled peanuts do not a tasty terminus of a meal make. Even if they’re served over shaved ice with custard sauce. ELV considers most Chinese desserts to be a bad joke…a bad joke that was developed over centuries of trying to find something sweet to eat at the end of a meal when the only things around were things like boiled peanuts and beans. But if you’re going to eat boiled beans over ice, we suppose Champion’s version is as good as any. 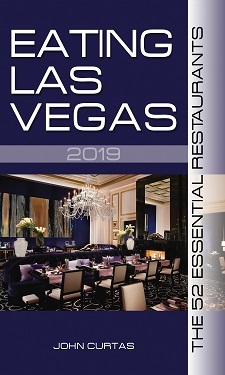 As for us, we’ll stick with a steaming bowl of spicy tendon beef noodle soup, a green onion pancake, or any of the bao (steamed buns) for one of the greatest, cheapest meals in all of Las Vegas. Celebrity Vodka – What’s the Point? Terrific! Which three days are they open? Lunch, dinner?